You are almost super-humanly upbeat. You have a very positive energy that surrounds you. And while you are happy go lucky, you’re also charmingly assertive. You get what you want, even if you have to persuade those against you to see things your way. Reflective and thoughtful, you know yourself well – and you know that you want out of life. I heard with interest your piece on the various different slots available to comedy programmes. So one programme that has no business whatsoever in the evening slot is No Commitments. It’s well written, well acted, good drama — but it’s never made me laugh. Banish it to the mornings, and leave us with something more entertaining in the evenings. Some time last week, I put my name and phone number into a double glazing website, and with my permission, they passed my details onto three carefully selected firms in my area. All three promply phoned up to make an appointment, and all three made a point of asking whether Mrs Foster could be there at the same time. And all three came at 90 minute intervals this morning. All the while, the drains people have been frantically finishing the work outside whilst the tarmac guy starts the making good work. During that, I also took four or five various phonecalls, which is fairly unusual. It’s been quite a morning! All three double glazing people have made the same sorts of noises whilst being shown around the house and garden and asked to quote for new windows throughout plus conservatory on the back. Two of them were prepared to give me a figure before leaving. It’s a little bit more than I thought and what with the kitchen also being a little bit more than I thought, and the drains also going over budget, it’s making the total house renovation budget a very large sum indeed. Certainly way more than we can recoup in the shorter term by adding value to the house. We’re starting to wonder if maybe we should stop renovations entirely, sell up and buy somewhere for the cost of this place plus the renovation budget. But… but… We’re here now. I hate moving. I haven’t unpacked yet (in fact there are boxes that I haven’t unpacked since before 2000). This property has a lot going for it in terms of location, and the garden could be amazing, even if the foxes do keep leaving mutilated avian corpses (1) on the lawn. Do we really need a conservatory? We definitely need a new kitchen, as the present is driving us mad. Can’t wait too long for a washing machine. But we wonder what would we use the conservatory for, since the sitting-room and dining room don’t get used that often. It’s a huge amount of money to spend on a room that would essentially be used for drying washing, starting seedlings and, erm, as a cat bedroom. A text exchange last week. I’m in Sainsbugs, do you want anything? Yay! Peanut Butter KitKat. I’ve waited years for this moment. Peanut butter on list anyway. Crunchy or smooth? Yes. And Peanut Butter Kitkat. You’re kidding me, What’s that? Kitkat bar with peanut butter in, of course. Can’t see any. They have kitkats in following variety: milk choc, dark choc, white choc, mint, orange and caramac. At which point I say I don’t believe in Peanut Butter KitKat and think he’s setting me up. I found Peanut Butter KitKat further down aisle on other side from all the other flavours. Anyway I am about to bite into one. I have waited years for this moment. Yes. Oh yes. Better than I could have imagined. Oh Lordy. Peanut Chunky Butter Kitkat chocolate doverose. Glaah. Glaah glaaah glaaah . I think Glaah is a very good word to use in association with peanut butter. 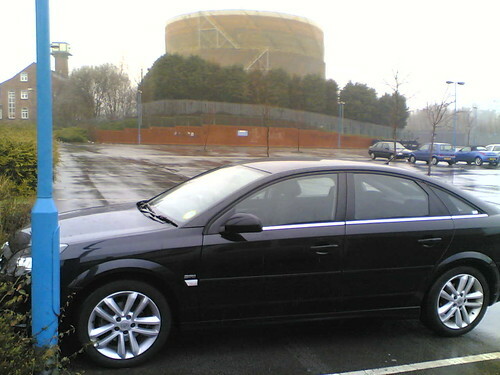 A sleek, black Vauxhall Vectral 1.9 diesel, 6 speed gear box, 9000 miles on the clock, 0 to $stupid in the blink of an eye, cockpit a sea of blinking microswitches is mine, all mine… until my M reg Skoda comes back out of exploratory surgery to find out why it’s overheating even since the new thermostat went in. I kinda understand why my insurance company don’t want me driving something like this, and I feel slightly nervous stewarding 12 grandsworth of car through 6 junctions of the M1. I’ve been driving unusually courteously. Must make doubly sure I don’t accidentally get locked in the bingo hall car park tonight. And you know, we might just be making an unnecessary day trip on Sunday! Ooh, Mothering Sunday! I have mostly been stuffing envelopes. Members’ newsletter. Absolutely has to go out NOW because it includes details of Regional Conference on Saturday, and unless I get these envelopes in the post tonight, it will be too late by the time people receive it. Luckily, in Nottingham, I have discovered from previous mailshots, that putting 200 envelopes in the main sorting office post box before 7pm means almost all of the ones with Nottingham addresses will get there by noon the next day, even if you use a second-class stamp. Group meeting helped, because I could get fellow councillors to help with the stuffing. I’m very grateful for their efforts. Unfortch, I forgot to take the postage with me, so had to bring the stuffed envelopes home to stamp myself. It takes about 40 minutes to stamp all those envelopes. Co-incidentally, the length of time it takes to watch an episode of 24. Another Incident at CTU. Oh, dear. Checking my post at the Council, there was a letter and an invite from Ed and Russell, who are fighting council elections this year, and wondered if I’d like to help. They put it a little more forcefully than “wonder.” They included an invite to a swanky party and a reply form that gave various options from “I’ll dedicate my life to seeing you elected” to “Here’s a book of stamps, now F off.” I was in two minds — there’s a certain chutzpah in asking people to help with your election when many of the people you ask will be busy with their own. But, don’t ask, don’t get. I sent them the leftover stamps from the members’ mailing, and I’m seeing if I can make it down for the 11th/12th April for a few hours of off-peak time. Maybe, maybe not. Right. Off to the post office with this huge stack of envelopes. I was driving home from work with the plan to take P straight out for dinner, as I was late, we were both starving, and neither of us particularly felt like cooking. When I got home, there was a car blocking the entrance to my road. I live on a residential side-street just off a fairly steep principle thoroughfare. The car was right, slap-bang in the middle of my road. It had parking lights on, although kerbside, not the ones in the middle of the road. So, once home, I phone the non-emergency number for Nottinghamshire Police, and get through after a moderate wait. Explain the problem, and after taking details, Control asks me for the car registration number so that she can carry out a registered keeper check. I didn’t take that info down, and I’m using the house phone, not my mobile, so I can’t go down and look. Explaining all this, the officer promises to phone me back, and I trundle down the hill to get the reg plate. Off I trundle. By now, there are several cars trying to negotiate the hazard, and a few local kids are peering in through the windows. After taking the plate, we establish the car is not running, it’s locked and secure. There is no sign of the owner, and no sign it’s been stolen. P’s thoughts that the owner was taken ill and had to leave to get help don’t really make sense either as, apart from being in a daft place, the car is perfectly parked. Back home, I wait for the police to phone back, and eventually, after 20 minutes of waiting, I discover the phone’s not been properly on the hook, so the police won’t have been able to get through if they’ve been trying. I phone them back, and this time, there’s a much longer wait to get through. I think it got to almost half an hour of the most unbelievably cheesy hold music, along with repeats of the message that my call was important, and a voice telling me in which circumstances I should hang up and phone 999. Also, it gave me the option to try for Crimestoppers and rather more worryingly, the Terrorism Hotline, if I felt I had info for those two bodies. When we walked back down the hill to head out to eat, there were indeed officers on site. They had just begun to knock on doors to see if anyone knew anything about, and I stopped to talk to them for a bit. Their working hypothesis was that the handbrake had failed and the car had rolled down the hill. That didn’t seem right either, to us, because it would have rolled a lot further, we think. But as people who live on a hill, we’re well aware of the importance of leaving the car in gear. A registered keeper check had shown that the car was registered in Milton Keynes, which wasn’t helpful in working out which door in the immediate vicinity to knock on. After a bit of canvassing, they had decided to tow the car away. It was still there when we came back from eating an hour and half later, but was towed a little bit after that. Too much excitement for one night!